Aviation experts estimate that every commercial airplane in the world is struck by lightning at least once per year. Around 90 percent of these strikes are likely triggered by the aircraft itself: In thunderstorm environments, a plane's electrically conductive exterior can act as a lightning rod, sparking a strike that could potentially damage the plane's outer structures and compromise its onboard electronics. To avoid lightning strikes, flights are typically rerouted around stormy regions of the sky. 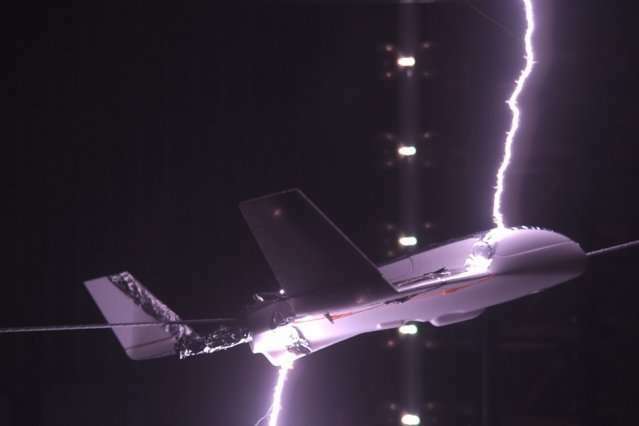 Now, MIT engineers are proposing a new way to reduce a plane's lightning risk, with an onboard system that would protect a plane by electrically charging it. The proposal may seem counterintuitive, but the team found that if a plane were charged to just the right level, its likelihood of being struck by lighting would be significantly reduced. The idea stems from the fact that, when a plane flies through an ambient electric field, its external electrical state, normally in balance, shifts. As an external electric field polarizes the aircraft, one end of the plane becomes more positively charged, while the other end swings towards a more negative charge. As the plane becomes increasingly polarized, it can set off a highly conductive flow of plasma, called a positive leader—the preceding stage to a lightning strike. To be clear, lightning itself poses very little danger to passengers inside an aircraft, as a plane's cabin is well-insulated against any external electrical activity. In most cases, passengers may only see a bright flash or hear a loud bang. Nevertheless, an aircraft that has been hit by lightning often requires follow-up inspections and safety checks that may delay its next flight. If there is physical damage to the plane, it may be taken out of service—something the airlines would rather avoid. Guerra-Garcia and her colleagues looked at whether electrically charging an airplane would bring down its risk of lightning strikes—an idea that was initially suggested to them by collaborators at Boeing, the research sponsor.